Let’s have a closer look at these promising specs. There has been a lot of excitement about the upcoming new Nikon models in the past several days, particularly with respect to a hypothetical successor to the aging D700. It seems that we will still have to wait for that one; however, we were finally presented yesterday with a just-as-exciting Nikon D4. Sensor: The D4’s sensor gains 4 megapixels over the D3s to reach 16 Mpix. These extra pixels do not prevent it from offering record sensitivities up to 204,800 ISO. The image quality in high ISO looks to have been improved, too, and if this is confirmed, we can already announce that the D4 will set new records, as the D3s is already the best-ranked camera on DxOMark for high ISO performance. Autofocus: The 51-point layout of the D3s was retained, but the sensitivity of the autofocus points was improved to make the camera even more efficient in low light. The autofocus will also work with apertures as small as f/8 (on a limited number of points, however); no doubt that photographers shooting with teleconverters will like this improvement. A new face detection mode has been added and will be available even when using the optical viewfinder — a first! Video shooting: Nikon obviously wants to catch up with Canon in this area, and offers a lot of improvements that will most certainly appeal to videographers. Full HD at 30/25/24 fps, of course (60 fps being possible in 720p mode), microphone input with volume-level monitor, uncompressed live HDMI output (the press conference we attended was filmed by three Nikon D4 and broadcast live on the web), DX and CX crop modes (x1.5 and x2.7). Last but not least, the autofocus still works in video mode, and all shooting parameters can be changed during recording. Burst mode: The burst mode reaches 10 frames per second with autofocus and automatic exposure, and can even reach 11 fps in FX mode if users lock focus and exposure. The D3s reached “only” 9 fps in FX mode, reserving its 11 fps for DX mode. A new x1.2 crop mode has been added to the usual DX (x1.5) crop mode for still pictures. A new 91k-point light-metering sensor. Dual card slot: one CF slot, of course, but also a brand-new XQD slot. A new Expeed 3 processor that allows all processing options to be enabled without slowing down the burst frame rate. A new WT-5 WiFi module that lets the camera act as a HTTP server so that its content can be accessed from any WiFi device (smartphone, tablet, laptop). Also allows full remote camera control. New joysticks for AF point selection, accessible both in portrait and landscape orientation. Retro-illuminated buttons, making shooting in the dark easier. The camera will be sold starting on February 16th at a recommended price of 5799€. Last Friday we had the chance to attend the Nikon press conference introducing the Nikon D4 and lay our hands on a pre-production model used for filming and broadcasting the conference live on the web. The first thing that struck us when holding the D4 with the new AF-S 85mm f/1.8G lens mounted is that the couple feels incredibly light. Of course, we’re talking about a camera that weighs 1340g without a lens, but it is well-balanced and fits perfectly in your hand. A Nikon official told us that the weight was reduced by about 60g compared to the D3s, and that they had a hard time doing so since the D3s was already very optimized on this point. When putting your eye to the viewfinder, you discover a large and bright image — no improvement over the D3s there, but still a very pleasing experience, especially when you are used to APS-C cameras. The camera is extremely responsive, and even in the poor lighting conditions, the autofocus responds instantly with perfect accuracy. Among the small details and improvements we were shown, we liked the new joystick that lets you choose your autofocus point from among the 51 available very quickly. Its shape will be familiar to Canon users, and the fact that it is repeated at the back of the camera (for portrait shots) is a welcome addition (one shared with the Canon EOS 1D X). The joystick can also be used for scrolling through an image in playback mode. We also liked the fact that the autofocus mode (AF-S or AF-C) is indicated in the viewfinder and can be changed very easily without taking your eye from the viewfinder. When looking at the pictures we shot on the 3.2″ LCD screen, we found the high ISO performance to be satisfying. Of course, ISO 208,400 photos are not noiseless, and we could even see some mild banding, but it was already a miracle that the image was not drowned out by noise at such a high sensitivity! (Remember that we’re working with JPEG images shot with a pre-production camera, and since we were not allowed to take any images back home, we will have to wait until we have a production camera and RAW images to pass along definitive advice.) Apart from that, the screen itself looks well-defined, maybe a bit dull — but nothing to worry about. One of the most highlighted features was the new WiFi module that allows using any WiFi device as a file browser and as a remote control for the camera. Attendees were invited to connect to the camera to their iPhone to try it for themselves, and the feature was also demonstrated on an iPad. The most impressive thing about this new feature is that you really do have full control over the camera through a simple web browser. You can see the live-view image at a decent frame rate, change shooting parameters, shoot pictures, and even shoot videos without having to install anything! We were told that iPhone and iPad applications are under development to make the user experience even better on these platforms. All in all, from what we could see, the Nikon D4 brings improvements to almost every feature that previously existed, and includes everything you could expect from a camera at this price tag. It will be very interesting to see how well its sensor performance competes against the Canon EOS 1D X, which should be available a bit later. We cannot wait to see these two models in our laboratory! While we wait for Sony’s promised pro reflex (which will undoubtedly evolve in terms of higher definition), and since all the other competitors’ results are available, let’s first compare the Nikon D4 with the Nikon D800 (whose 36Mpix offering took its inspiration from the D4’s prosumer version). Then we’ll see how the D4 evolved by comparing it with its predecessor, the D3s, and then, finally, we’ll compare it with the Canon EOS-1D X, its true rival. The complete comparison is available here: Nikon D4 vs Nikon D3s. New CMOs Full-Frame 16 Mpix sensor (FX mount). Minimum sensitivity lowered to 100 ISO (vs 200 ISO on the D3s). Maximum sensitivity of 25 600 ISO (extendible to 204 800 ISO). New 16-bit EXPEED 3 sensor signal processor for handling Active D-Lighting image calculation, scene detection and analysis, Full HD video encoding, etc. New 91,000-pixel scene recognition (vs. only 2000 pixels for the next most recent model, the D7000). This sensor prepares the work of the sensor upstream by analyzing the scene framework so as to adapt the camera settings, works with autofocus, assists with subject tracking, analyzes the light source, detects the presence of faces, etc. The scene type database is reduced from 50,000 to only 30,000, thanks to the sensor’s better definition. 3D Color Matrix III exposure management. The Nikon D4 offers viewfinder-based face detection, a first, thanks to its new scene recognition sensor. HDR mode: the D4 mixes images between 0Ev and +3EV to arrive at an HDR photo calculated directly in the camera itself. Full HD video mode (24p, 25p, 30p) on a memory card or via HDMI 4:2:2 recorder without sensor signal processing for a rate of 200 Mbps — in other words, broadcast quality. The D4 offer different shooting ratios in video: FX, DX (1.5x crop equivalent to Super35) and CX (2.7x, using the sensor’s central 1920 x 1080 pixel plane). Time Lapse: the D4 permits recording and composition of time-lapse videos compiled in the camera itself over the course of several days. As with the D3s, the Nikon offers 51-point autofocus. While the module is still called “Multi-Cam 3500 FX,” it’s actually a very new and different autofocus that has been integrated into this pro reflex. It is more sensitive and can work in low-light down to just 2EV (moonlight). It is also more versatile, with 15 cross-type collimators (11 sensitive to f/8), thus more efficient when using a telephoto lens and focal doubling system. When one tilts the D4 to shoot in portrait orientation, the active autofocus collimator adapts so as to position itself on the same subject. The D4’s new shutter has undergone 400,000 test cycles. Noticeably loud, the Nikon D4 recalibrated its “Quiet” mode for quieter shooting. The D4 has an electronic for shooting in complete silence at 1920 x 1080-pixel resolution. The D4 adopts an ergonomic “must-have”: its buttons are lit in the dark. Burst shooting at 10 fps when AF tracking is active and at 11 fps when deactivated. As the shutter ages, it tends to slow down. The D4 offers a guarantee that the exposure will always be correct. In video mode, one can use the test buttons to fine-tune the depth of field and Fn in increments of 1/8 EV. The D4 has two joysticks, one of which for use in portrait orientation. More intuitive handling: Unlike the D3s, the D4’s controls are in the same place in portrait orientation as when in landscape orientation. The D4’s pentaprism was redesigned to adapt to its new mechanism for tilting the mirror, but its viewfinder still provides the same 100% coverage and 0.7x magnification. The D4 has an ethernet port. In addition to a microphone jack, the D4 offers a headphone jack as well as an integrated viewmeter. Compact flash card and XQD dual card slots for photo and video storage. The D4 is the first camera to adopt this new type of memory card that should deliver very high transfer rates, on the order of 720 Mbps at launch. New EN-EL18 battery: due to new regulations governing electronic devices in Japan, Nikon had to redesign and reduce the power of its pro reflex battery to 2000 mAh — thus dropping the autonomy from 4200 images to only 2600. The D4 is compatible with the new WT-5 Wi-Fi transmitter that allows it to interact with any smartphone or tablet on the market and to view photos via internet browser. Nikon is planning on launching an iPhone and iPad application that allows users to control the camera remotely. Nikon Camera Control Pro 2 is compatible with D4 video controls. The complete comparison is available here: Nikon D4 vs Canon EOS-1D X. The sensor results for the Nikon D4 are now available, and they do not disappoint! With a DxOMark Overall score of 89, the Nikon D4 surpasses the next-best Full-Frame sensor by just one little point, the now second-place Nikon D3x. The D4’s Low-Light ISO score of 2965 is barely 0.15 stop less than that of the best sensor analyzed up until now (the Nikon D3s). Its Portrait (24.7) and Landscape (13.1) scores, while not exceptional, are still very high-level. So the D4 is a big success for Nikon, who has succeeded in placing 4 its cameras among the top 10 best DxOMark sensor scores. Only Phase One is ahead with its high-resolution but expensive Phase One IQ 180. The DxOMark Overall score is derived from three different “use case” scores — Portrait, Landscape, and Sports. These three scores let you get a better look at the specific characteristics of each sensor. For the Portrait score, we analyzed the sensor’s ability to provide vivid, varied, and accurate colors under good lighting conditions (i.e., studio). 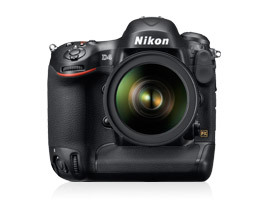 The D4’s score is 24.7 bits — a remarkable score and identical to that achieved by the Nikon D3x. Only certain medium-format cameras (e.g., Phase One IQ 180 and P65 Plus) do better. This score is interesting particularly for those who take photographs under studio conditions without lighting constraints and who want optimal color rendering. The Nikon D4 can respond to the demand for good color, but its 16 Mpix sensor will be certainly limiting for this kind of use. — Good thing, since the D4 isn’t really intended for portrait photographers, who really should wait for the test results of the Nikon D800, which with its much better resolution perhaps comes a little closer to the best sensor in this area, the Phase One IQ 180’s. For the Landscape score, it’s only the black and white dynamic range that counts — specifically, the maximum dynamic range that the sensor will be able to capture under good lighting conditions. This score will interest aficionados of landscape photos and strong contrasts. The Nikon D4 achieves 13.1: no problem here, high-contrast images (sunsets or back-lit, for example) can be shot with a maximum of details both for shadows and highlights. Still, the results are a bit disappointing: we expected much better from the new Full-Frame sensors. As things stand, the 16Mpix Sony APS-C sensor (in the Pentax K5 and the Nikon D7000) stays way ahead — nearly 1 stop better. The Sport score (alias Low-Light ISO score) lets you know how far you can go vis-à-vis ISO without compromising on image quality. This is the score we were particularly anxious to measure for the Nikon D4: its predecessor, the D3s, had blasted by its competitors with a dizzying score of 3253. Before this new camera appeared, Nikon already had the 3 best scores in this category for three cameras equipped with members of the same sensor family (the Nikon D3, D3s, and D700). The first non-Nikon camera in this category is the 5D Mark II, whose score equates to about 1 stop less (1815). The Nikon D4 lives up to our expectations with a Low-Light ISO score of 2965, or roughly the same score as the D3s (0.15 stop difference). No surprise here, the extreme 204,800 ISO will be a real challenge to handle even for the best raw converters. Nikon D4 vs Nikon D3s: Progress? For everything else that does not relate to sensor test results, see our previously-published Nikon D4 preview that lists all of the improvements and new features that the Nikon D4 brings with it with respect to the Nikon D3s. Seven points better for the Overall score, and 1 stop better each for Portrait and Landscape, with an almost identical score for the Sport use case. The D4 is a real evolution — its new Full-Frame 16 Mpix sensor keeps all its promises. It succeeds in correcting certain weaknesses of the D3s (notably those affecting its Portrait scores). No improvement in terms of quantum efficiency — just a real, additional ISO in the lower realms (i.e., ISO 100) that will allow users to take full advantage of the sensor in good lighting conditions. In terms of dynamic range, the Nikon D4 outperforms the D3s, especially for low ISO. One easily gains 1 stop at ISO 200. Nikon has significantly improved its noise management in shadows — at least at ISO 200. It’s the same story for color sensitivity— improvements are mainly up to ISO 800. In sum, this new 16 Mpix sensor brings with it some real improvements for low ISO (from 100 to 800). As for high ISO, its measurements are comparable to the Nikon D3s’s, which remains simply the best sensor in this area. Just a note about the management of dynamic range for the Nikon D4: Even if the results are higher, we don’t reach the same heights as with the Pentax K5 and Nikon D7000. However, at least for the moment, this APS-C sensor seems to be unequaled in terms of noise in shadows for low ISO, even taking into account the D4’s remarkable behavior. To end, here is the comparison that everyone’s been waiting for: Nikon D4 vs Canon EOS 1D-X. We will have to wait a little while longer before drawing any hard and fast final conclusions. Nikon has set the bar high, but no doubt Canon’s first full-frame camera will provide a worthy response.